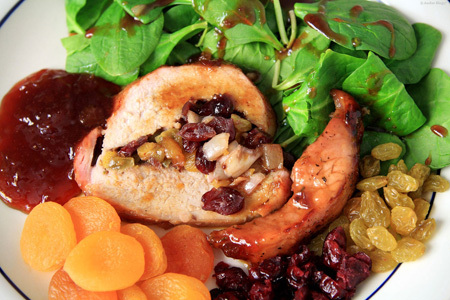 ﻿ Stuffed Loin of Pork with Winter Fruit - Merwanjee Poonjiajee & Sons Pvt. Ltd. Combine fruit plus 1/2 cup chutney. Stuff, roll, tie roast with kitchen twine. Make several slits in pork with knife tip, insert garlic. Rub roast with oil, sprinkle with thyme, salt & pepper. Roast on a rack for 1 hour. Mix remaining chutney with apple juice, pour over pork. Cook for 30 minutes more, baste every 10 minutes. Let stand 15 minutes before cutting in 1 inch slices. Serve hot with de greased pan gravy, or cold with extra chutney.